How do you explain the missing ending of the Gospel of St. Mark? The inclusion of Mark 16:9-20 has been debated by the scholars. A quick review of Internet based resources is below as well as my own conclusion at the end. The evidence is clear. This ending is not found in our earliest and most reliable Greek copies of Mark. In A Textual Commentary on the Greek New Testament, Bruce Metzger writes: “Clement of Alexandria and Origen [early third century] show no knowledge of the existence of these verses; furthermore Eusebius and Jerome attest that the passage was absent from almost all Greek copies of Mark known to them.”1 The language and style of the Greek is clearly not Markan, and it is pretty evident that what the forger did was take sections of the endings of Matthew, Luke and John (marked respectively in red, blue, and purple above) and simply create a “proper” ending. Because of patristic evidence from the late 2nd century for the existence of copies of Mark with the "Longer Ending," it is contended by a majority of scholars that the "Longer Ending" must have been written and attached no later than the early 2nd century. Scholars are divided on the question of whether the "Longer Ending" was created deliberately to finish the Gospel of Mark (as contended by James Kelhoffer) or if it began its existence as a freestanding text which was used to "patch" the otherwise abruptly ending text of Mark. Its failure to smoothly pick up the narrative from the scene at the end of 16:8 is a point in favor of the latter option. There is disagreement among scholars as to whether Mark originally stopped writing at 16:8—and if he did so, if it was deliberate or not—or if he continued writing an ending which is now lost. Allusions to a future meeting in Galilee between Jesus and the disciples (in Mark 14:28 and 16:7) seem to suggest that Mark intended to write beyond 16:8. 2. ^ Jump up to: a b c May, Herbert G. and Bruce M. Metzger. The New Oxford Annotated Bible with the Apocrypha. 1977. The Council of Trent, reacting to Protestant criticism, defined the Canon of Trent which is the Roman Catholic biblical canon. "Decretum de Canonicis Scripturis," issued in 1546 at the fourth session of the Council, affirms that Jesus commanded that the gospel was to be preached by His apostles to every creature—a statement clearly based on Mark 16:15. The decree proceeded to affirm, after listing the books of the Bible according to the Roman Catholic canon, that "If anyone receive not, as sacred and canonical, the said books entire with all their parts, as they have been used to be read in the Catholic Church, and as they are contained in the old Latin Vulgate edition, and knowingly and deliberately condemn the traditions aforesaid; let him be anathema." Since Mark 16:9-20 is part of the Gospel of Mark in the Vulgate, and the passage has been routinely read in the churches since ancient times (as demonstrated by its use by Ambrose, Augustine, Peter Chrysologus, Severus of Antioch, Leo, etc. ), the Council's decree affirms the canonical status of the passage. This passage was also used by Protestants during the Protestant Reformation; Martin Luther used Mark 16:16 as the basis for a doctrine in his Shorter Catechism. Mark 16:9-20 was included in the Rheims New Testament, and in the King James Bible and other influential translations. In most modern-day translations based primarily on the Alexandrian Text, it is included but is accompanied by brackets or by special notes, or both. The earliest clear evidence for Mark 16:9-20 as part of the Gospel of Mark is in Chapter XLV First Apology of Justin Martyr (c. 160). In a passage in which Justin treats Psalm 110 as a Messianic prophecy, he states that Ps. 110:2 was fulfilled when Jesus' disciples, going forth from Jerusalem, preached everywhere. His verbiage is remarkably similar to the wording of Mk. 16:20 and is consistent with Justin's use of a Synoptics-Harmony in which Mark 16:20 was blended with Lk. 24:53. Justin's student Tatian (c. 172), incorporated the "Longer Ending" into his Diatessaron, a blended narrative consisting of material from all four canonical Gospels. And Irenaeus (c. 184), in Against Heresies 3:10.6, explicitly cited Mark 16:19, stating that he was quoting from near the end of Mark's account. This patristic evidence is over a century older than the earliest manuscript of Mark 16. Writers in the 200's such as Hippolytus, Porphyry, and the anonymous author of De Rebaptismate also used the "Longer Ending." It is sometimes stated that Clement of Alexandria and Origen "show no knowledge" of these verses, as Metzger stated. (Some commentators have exaggerated Metzger's statement considerably.) However, Clement used only about two dozen verses from Mark—almost all from chapter 10—in his major writings, and Origen, in his major extant works, failed to use over 30 other 12-verse sections of Mark. Such casual non-use of a passage actually says very little, if anything, about the contents of the manuscripts used by these two writers. The last twelve verses, 16:9–20, are not present in two 4th-century manuscripts Sinaiticus and Vaticanus, the earliest complete manuscripts of Mark. (Papyrus 45 is the oldest extant manuscript that contains text from Mark, but it has no text from chapter 16 due to extensive damage). Codex Vaticanus has a blank column after ending at 16:8 and placing kata Markon, "according to Mark". There are three other blank columns in Vaticanus, in the Old Testament, but they are each due to incidental factors in the production of the codex—a change to the column-format, a change of scribes, and the conclusion of the Old Testament portion of the text—whereas the blank column between Mark 16:8 and the beginning of Luke is deliberately placed. Although it has been suggested that Codex Vaticanus may be reflecting a Western order of the gospels with Mark as the last book (Matthew, John, Luke, and Mark), the scholars making this suggestion (such as Daniel Wallace) have not explained why any scribe would think that the normal blank space at the end of a Gospels-codex would be worth perpetuating in a new copy in which the Gospels were arranged in a different order. 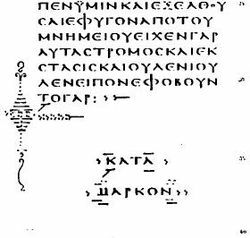 Sinaiticus ends with 16:8 and euangelion kata Markon, "the gospel according to Mark," on a page which is part of a replacement-sheet (consisting of four pages) on which the text of Mark 14:54-Luke 1:56 was written by the proof-reader of the manuscript. The text on these four pages was not written by the copyist who wrote the text on the surrounding pages; the pages containing Mark 14:54-Luke 1:56 written by that copyist were removed, and are not extant. (This is unfortunately not mentioned by Metzger; nor is it indicated in the UBS or Nestle-Aland textual apparatus. Nor do they mention Vaticanus' blank column.) On the replacement-pages, the copyist's rate of letters per column varies erratically. At first he wrote normally, but then he used compact lettering until Mark 15:19. At that point, the lettering begins to be written in stretched-out lettering, until the end of Mark 16:8 in column 10. The text of Luke 1:1-56, beginning at the top of column 11, is written in very compact lettering. This indicates that the copyist who made these four replacement-pages in Sinaiticus began by writing the text from Luke (beginning at the top of the 11th column) and then went back to add the text from Mark. After accidentally omitting several lines in 15:47-16:1, he had to stretch his lettering to avoid leaving a blank column between Mark 16:8 and Luke 1:1. Although the copyist, as proofreader, must have seen other blank columns in the codex and considered them unobjectionable, he apparently considered it worthwhile to avoid allowing a blank column to appear between the end of Mark and the beginning of Luke. When this is considered alongside the uniquely emphatic decorative design which follows Mark 16:8 in Sinaiticus, it seems clear that the copyist who made Sinaiticus' replacement-pages was aware of verses 9-20, and desired to prevent the possibility of their inclusion. The copyist who made this replacement-page in Codex Sinaiticus was very probably one of the scribes who helped produce Codex Vaticanus. Another manuscript, minuscule 304 (12th century) omits the last twelve verses. New examinations of 304 are warranted, especially considering that it has not been shown that 304 contains a subscription, or closing-title, after 16:8, although such a feature was persistently added at the end of a book by copyists in all eras. The absence of a colophon after 16:8 in 304 suggests that 304's copyist did not regard that as the end of the book. Codex Washingtonianus (late 4th, early 5th century) includes verses 9–20 and features an addition between 16:14-15 known as the "Freer Logion": "And they excused themselves, saying, 'This age of lawlessness and unbelief is under Satan, who does not allow the truth and power of God to prevail over the unclean things of the spirits [or, does not allow what lies under the unclean spirits to understand the truth and power of God]. Therefore reveal your righteousness now' – thus they spoke to Christ. And Christ replied to them, 'The term of years of Satan's power has been fulfilled, but other terrible things draw near. And for those who have sinned I was handed over to death, that they may return to the truth and sin no more, in order that they may inherit the spiritual and incorruptible glory of righteousness that is in heaven.'" The group of manuscripts known as "Family 1" and others add a note to Mark 16:9–20, stating that some copies do not contain the verses. Codex L adds the "shorter ending" after 16:8 and follows it with vv. 9–20. The group of manuscripts known as "Family K1" has text of Mark 16:9-10 without numbered κεφαλαια (chapters) at the margin and their τιτλοι (titles) at the top (or the foot). Mark 16:9–20 is preserved in its traditional form in about a dozen uncials (the earliest being Codex Alexandrinus) and in all undamaged minuscules. The vast majority of contemporary New Testament textual critics (see also Textual criticism) have concluded that neither the longer nor shorter endings were originally part of Mark's Gospel. This conclusion extends back as far as the middle of the nineteenth century. Harnack, for instance, was convinced that the original ending was lost. Rendel Harris (1907) supplied the theory that Mark 16:8 had continued with the words "of the Jews." By the middle of the 20th century, it had become the dominant belief that the Long Ending was not genuine. By this time, most translations were adding notes to indicate that neither the Long Ending nor the Short Ending were original. Examples include Mongomery's NT ("The closing verses of Mark's gospel are probably a later addition...," 1924); Goodspeed's (who includes both endings as "Ancient Appendices," 1935); Williams' NT ("Later mss add vv. 9-20," 1937); and the Revised Standard Version (1946), which placed the Long Ending in a footnote. Tradition intervened, and by the early 1970s the complaints in favor of the verses were strong enough to prompt a revision of the RSV (1971) which restored the verses to the text—albeit with a note about their dubiousness. The vast majority of modern scholars remain convinced that neither of the two endings is Marcan. In Textual Commentary on the Greek New Testament Metzger states: "Thus, on the basis of good external evidence and strong internal considerations it appears that the earliest ascertainable form of the Gospel of Mark ended with 16:8. Three possibilities are open: (a) the evangelist intended to close his Gospel at this place; or (b) the Gospel was never finished; or, as seems most probable, (c) the Gospel accidentally lost its last leaf before it was multiplied by transcription." The 1984 printing of the NIV translation notes: "The most reliable early manuscripts and other ancient witnesses do not have Mark 16:9–20." However, the Committee on Bible Translation has since changed this to read "The earliest manuscripts and some other ancient witnesses do not have Mark 16:9–20." Few doctrines of the mainline Christian denominations stand or fall on the support of the longer ending of Mark. The longer ending does identify Mary Magdalene as the woman out of whom Jesus had exorcised seven demons (but so does Luke 8:2), but Mary Magdalene's significance, and the practice of exorcism, are both supported by New Testament texts outside the debated passage. Mark 16:16 is cited as evidence for the requirement of believer's baptism among churches of the Restoration Movement. Mark 16:17 is specifically cited as Biblical support for some of these denominations' teachings concerning exorcism and spiritual warfare, and also in support of speaking in tongues. The practice of snake handling and of drinking strychnine and other poisons, found in a few offshoots of Pentecostalism, find their Biblical support in Mark 16:18. These churches typically justify these practices as "confirming the word with signs following" (KJV), which references Mark 16:20. Other denominations believe that these texts indicate the power of the Holy Spirit given to the apostles, but do not believe that they are recommendations for worship. The longer ending was declared canonical scripture by the Council of Trent. Today, however, Roman Catholics are not required to believe that Mark wrote this ending. The Catholic NAB translation includes the footnote: "[9–20] This passage has traditionally been accepted as a canonical part of the gospel and was defined as such by the Council of Trent. Early citations of it by the Fathers indicate that it was composed by the second century, although vocabulary and style indicate that it was written by someone other than Mark. It is a general resume of the material concerning the appearances of the risen Jesus, reflecting, in particular, traditions found in Luke 24 and John 20." An incomplete summary of the manuscripts and versions that contain Mark 16:9–20 can be found in the apparatuses of the Nestle-Aland 27th edition and the fourth edition of United Bible Societies' Greek New Testament. Omit Mark 16:9–20: Codex Sinaiticus, Vaticanus, 304, Syriac Sinaiticus, a Sahidic manuscript, Armenian manuscripts; Eusebius, manuscripts according to Eusebius, manuscripts according to Jerome (who was repeating part of Eusebius' statements, condensing them as he loosely rendered them into Latin). Add but marked with asterisks, obeli or other critical note in manuscripts: f1, 22, 138, 205, 1110, 1210, 1221, 1582. Present, but without the title and chapter marks: Minuscule 461. Add 16:9–20: A, C, D, W, Codex Koridethi, f13, 33, 565, 700, 892, 2427 (which is, however, a forgery), 2674, the Majority/Byzantine Text (over 1,200 manuscripts of Mark); the Vulgate and part of the Old Latin, Syriac Curetonian, Peshitta, Bohairic; Irenaeus, manuscripts according to Eusebius, Marinus, Acts of Pilate, manuscripts according to Jerome (add with obeli f1 al), Ambrose, Aphraates, Augustine, Augustine's Latin copies, Augustine's Greek manuscripts, Tatian's Diatessaron, Eznik of Golb, Pelagius, Nestorius, Patrick, Prosper of Aquitaine, Leo the Great, Philostorgius, Life of Samson of Dol, Old Latin breves, Marcus Eremita, Peter Chrysologus. Add shorter ending only: Codex Bobbiensis (Latin), with a unique interpolation between 16:3 and 16:4 and with the last phrase of 16:8 omitted. Add shorter and longer ending: L (019), Ψ (044), 0112, 099, 274 (margin) 579 lectionary 1602, Syriac Harclean margin, Sahidic manuscripts, Bohairic manuscripts (Huntington MS 17), Ethiopic manuscripts. Add 16:9–20 with "Freer Logion": Codex Washingtonianus (4th/5th century); manuscripts according to Jerome. · Mark 16:9-20 has been called a later addition to the Gospel of Mark by most New Testament scholars in the past century. The main reason for doubting the authenticity of the ending is that it does not appear in some of the oldest existing witnesses, and it is reported to be absent from many others in ancient times by early writers of the Church. Moreover, the ending has some stylistic features which also suggest that it came from another hand. The Gospel is obviously incomplete without these verses, and so most scholars believe that the final leaf of the original manuscript was lost, and that the ending which appears in English versions today (verses 9-20) was supplied during the second century. Below are some excerpts from various scholarly sources that conclude that the verses are a later addition. · Nevertheless, some scholars have not been impressed with the evidence against these verses, and have maintained that they are original. These scholars have pointed out that the witnesses which bring the verses into question are few, and that the verses are quoted by church Fathers very early, even in the second century. To represent this point of view we give below a long excerpt from F.H.A. Scrivener, together with its footnotes. · F.H.A. Scrivener, A Plain Introduction to the Criticism of the New Testament, fourth ed. (London: George Bell and Sons, 1894), volume 2, pp. 337-344. · Mark xvi. 9-20. In Vol. I. Chap. 1, we engaged to defend the authenticity of this long and important passage, and that without the slightest misgivings (p. 7). Dean Burgon's brilliant monograph, 'The Last Twelve Verse of the Gospel according to St. Mark vindicated against recent objectors and established' (Oxford and London, 1871), has thrown a stream of light upon the controversy, nor does the joyous tone of his book miscome one who is conscious of having triumphantly maintained a cause which is very precious to him. We may fairly say that his conclusions have in no essential point been shaken by the elaborate and very able counter-plea of Dr. Hort (Notes, pp. 28-51). This whole paragraph is set apart by itself in the critical editions of Tischendorf and Tregelles. Besides this, it is placed within double brackets by Westcott and Hort, and followed by the wretched supplement derived from Cod. L (vide infra), annexed as an alternative reading (αλλως). Out of all the great manuscripts, the two oldest (א B) stand alone in omitting vers. 9-20 altogether. 1 Cod. B, however, betrays consciousness on the scribe's part that something is left out, inasmuch as after εφοβουντο γαρ ver. 8, a whole column is left perfectly blank (the only blank one in the whole volume 2), as well as the rest of the column containing ver. 8, which is usual in Cod. B at the end of every other book of Scripture. No such peculiarity attaches to Cod. א. The testimony of L, that close companion of B, is very suggestive. Immediately after ver. 8 the copyist breaks off; then in the same hand (for all corrections in this manuscript seem prima manu: see p. 138), at the top of the next column we read ... φερετε που και ταυτα ... παντα δε τα παρηγγελμενα τοις περι του πετρον συντομωσ εξηγγιλαν μετα δε ταυτα και αυτος ο ισ απο ανατολησ και αχρι δυσεωσ εξαπεστιλεν δι αυτων το ιερον και αφθαρτον κηρυγμα τησ αιωνιου σωτηριασ ... εστην δε και ταυτα φερομενα μετα το εφοβουντο γαρ ... Αναστασ δε, πρωι πρωτη σαββατ κ.τ.λ.,, ver. 9, ad fin. capit. (Burgon's facsimile, facing his page 113: our facsimile No. 21): as if verses 9-20 were just as little to be regarded as the trifling apocryphal supplement 3 which precedes them. Besides these, the twelve verses are omitted in none but some old Armenian codices 4 and two of the Ethiopic, k of the Old Latin, and an Arabic Lectionary [ix] No. 13, examined by Scholz in the Vatican. The Old Latin Codex k puts in their room a corrupt and careless version of the subscription in L ending with σωτηριας (k adding αμην): the same subscription being appended to the end of the Gospel in the two Ethiopic manuscripts, and (with αμην) in the margin of 274 and the Harkleian. Not unlike is the marginal note in Hunt. 17 or Cod. 1 of the Bohairic, translated by Bishop Lightfoot above. Of cursive Greek manuscripts 137, 138, which Birch had hastily reported as marking the passage with an asterisk, each contains the marginal annotation given below, which claims the passage as genuine, 138 with no asterisk at all, 137 (like 36 and others) with an ordinary mark of reference from the text to the note, where (of course) it is repeated. 5 Other manuscripts contain marginal scholia respecting it, of which the following is the substance. Cod. 199 has τελος 6 after εφοβουντο γαρ and before Αναστας δε, and in the same hand as τελος we read, εν τισι των αντιγραφων ου κειται ταυτα, αλλ ενταυθα καταπαυει. The kindred Codd. 20, 215, 300 (but after ver. 15, not ver. 8) mark the omission in some (τισι) copies, adding εν δε τοις αρχαιοις παντα απαραλειπτα κειται, and these had been corrected from Jerusalem copies (see pp. 161 and note, 193). Cod. 573 has for a subscription εγραφη και αντεβληθη ομοιως εκ των εσπουδασμενων κεφαλαιοις σλζ: where Burgon, going back to St. Matthew's Gospel (see p. 161, note) infers that the old Jerusalem copies must have contained our twelve verses. Codd. 15, 22 conclude at εφοβουντο γαρ, then add in red ink that in some copies the Evangelist ends here, εν πολλοις δε και ταυτα φερεται, affixing verses 9-20. In Codd. 1, 250 (in its duplicate 206 also), 209, is the same notice, αλλοις standing for πολλοις in 206, with the additional assertion that Eusebius "canonized" no further than ver. 8, a statement which is confirmed by the absence of the Ammonian and Eusebian numerals beyond that verse in אALSU and at least eleven cursives, with am. fuld. ing. of the Vulgate. It would be no marvel if Eusebius, the author of this harmonizing system, had consistently acted upon his own rash opinion respecting the paragraph, an opinion which we shall have to notice presently, and such action on his part would have added nothing to the strength of the adverse case. But it does not seem that he really did so. These numerals appear in most manuscripts, and in all parts of them, with a good deal of variation which we can easily account for. In the present instance they are annexed to ver. 9 and the rest of the passage in Codd. CEKVΠ, and (with some changes) in GHMΓΔΛ and many others: in Cod. 566 the concluding sections are there (σλδ ver. 11, σλε ver. 12, σλς ver. 14) without the canons. In their respective margins the annotated codices 12 (of Scholz), 24, 36, 37, 40, 41, 108, 129, 137, 138, 143, 181, 186, 195, 210, 221, 222, 237, 238, 255, 259, 299, 329, 374 (twenty-four in all), present in substance 7 the same weighty testimony in favour of the passage: παρα πλειστοις αντιγραφοις ου κειται (thus far also Cod. 119, adding only ταυτα, αλλ ενταυθα καταπαυει) εν τω παροντι ευαγγελιω, ως νοθα νομισαντες αυτα ειναι αλλα ημεις εξ ακριβων αντιγραφων εν πλειστοις ευροντες αυτα και κατα το Παλαιστιναιον ευαγγελιον Μαρκου, ως εχει η αληθεια, συντεθεικαμεν και την εν αυτω επιφερομενην δεσποτικην αναστασιν. Now this is none other than an extract from Victor of Antioch's [v] commentary on St. Mark, which they all annex in full to the sacred text, and which is expressly assigned to that Father in Codd. 12, 37, 41. Yet these very twenty-four manuscripts have been cited by critical editors as adverse to the authenticity of a paragraph which their scribes never dreamt of calling into question, but had simply copied Victor's decided judgement in its favour His appeal to the famous Palestine codices which had belonged to Origen and Pamphilus (see p. 55 and note), is found in twenty-one of them, possibly these documents are akin to the Jerusalem copies mentioned in Codd. Evan. Λ, 20, 164, 262, 300, &c.
· The earliest objector to vers. 9-20 we know of was Eusebius (Quaest. ad Marin. ), who tells us that they were not εν απασι τοις αντιγραφοις, but after εφοβουντο γαρ that τα εξης are found σπανιως εν τισιν, yet not τα ακριβη: language which Jerome twice echoes and almost exaggerates by saying, 'in raris fertur Evangeliis, omnibus Graeciae libris paene hoc capitulum fine non habentibus.' A second cause with Eusebius for rejecting them is μαλιστα ειπερ εχοιεν αντιλογιαν τη των λοιπων ευαγγελιστων μαρτυρια. 12 The language of Eusebius has been minutely examined by Dean Burgon, who proves to demonstration that all the subsequent evidence which has been alleged against the passage, whether of Severus, or Hesychius, or any other writer down to Euthymius Zigabenus in the twelfth century, is a mere echo of the doubts and difficulties of Eusebius, if indeed he is not retailing to us at second-hand one of the fanciful Biblical speculations of Origen. Jerome's recklessness in statement as been already noticed (Vol. II. p. 269); besides that, he is a witness on the other side, both in his own quotations of the passage and in the Vulgate, for could he have inserted the verses there, if he had judged them to be spurious? · With regard to the argument against these twelve verses arising from their alleged difference in style from the rest of the Gospel, I must say that the same process might be applied — and has been applied — to prove that St. Paul was not the writer of the Pastoral Epistles (to say nothing of that to the Hebrews), St. John of the Apocalypse, Isaiah and Zechariah of portions of those prophecies that bear their names. Every one used to literary composition may detect, if he will, such minute variations as have been made so much of in this case, 13 either in his own writings, or in those of the authors he is most familiar with. · Persons who, like Eusebius, devoted themselves to the pious task of constructing harmonies of the Gospels, would soon perceive the difficulty of adjusting the events recorded in vers. 9-20 to the narratives of the other Evangelists. Alford regards this inconsistency (more apparent than real, we believe) as 'a valuable testimony to the antiquity of the fragment' (N.T. ad loc. ): we would go further, and claim for the harder reading the benefit of any critical doubt as to its genuineness (Canon I. Vol. II. p. 247). The difficulty was both felt and avowed by Eusebius, and was recited after him by Severus of Antioch or whoever wrote the scholion attributed to him. Whatever Jerome and the rest may have done, these assigned the αντιλογια, the εναντιωσις they thought they perceived, as a reason (not the first, nor perhaps the chief, but still as a reason) for supposing that the Gospel ended with εφοβουντο γαρ. Yet in the balance of probabilities, can anything be more unlikely than that St. Mark broke off so abruptly as this hypothesis would imply, while no ancient writer has noticed or seemed conscious of any such abruptness? 14 This fact has driven those who reject the concluding verses to the strangest fancies: — namely, that, like Thucydides, the Evangelist was cut off before his work was completed, or even that the last leaf of the original Gospel was torn away. (1) The ending was attached no later than the 2nd Century (Wikipedia). It was deemed canonical by the Council of Trent and was used by Martin Luther. (3) The longer ending (Wikipedia) was declared canonical scripture by the Council of Trent. Today, however, Roman Catholics are not required to believe that Mark wrote this ending. The Catholic NAB translation includes the footnote: "[9–20] This passage has traditionally been accepted as a canonical part of the gospel and was defined as such by the Council of Trent. Early citations of it by the Fathers indicate that it was composed by the second century, although vocabulary and style indicate that it was written by someone other than Mark. It is a general resume of the material concerning the appearances of the risen Jesus, reflecting, in particular, traditions found in Luke 24 and John 20." 1Brown, Raymond E. An Introduction to the New Testament. Doubleday, 1997, p.148. In this footnote, Brown refers to another author’s opinion about Catholics not being required to believe this ending. (4) Few doctrines (Wikipedia) of the mainline Christian denominations stand or fall on the support of the longer ending of Mark. The longer ending does identify Mary Magdalene as the woman out of whom Jesus had exorcised seven demons (but so does Luke 8:2), but Mary Magdalene's significance, and the practice of exorcism, are both supported by New Testament texts outside the debated passage. (5) Mark 16:9-20 has been called (Bible-researcher) a later addition to the Gospel of Mark by most New Testament scholars in the past century. The main reason for doubting the authenticity of the ending is that it does not appear in some of the oldest existing witnesses, and it is reported to be absent from many others in ancient times by early writers of the Church. Moreover, the ending has some stylistic features which also suggest that it came from another hand. The Gospel is obviously incomplete without these verses, and so most scholars believe that the final leaf of the original manuscript was lost, and that the ending which appears in English versions today (verses 9-20) was supplied during the second century. (6) Some scholars (Bible-researcher) have not been impressed with the evidence against these verses, and have maintained that they are original. These scholars have pointed out that the witnesses which bring the verses into question are few, and that the verses are quoted by church Fathers very early, even in the second century. To represent this point of view, read the long excerpt from F.H.A. Scrivener (1894) together with its footnotes. See above this conclusion. Dr. C. Taylor, Master of St. John's College, Cambridge, in The Expositor for July 1893, quotes more evidence from Justin Martyr — hinting that some also remains behind — proving that that Father was familiar with these verses. Also he cites several passages from the Epistle of Barnabas in which traces of them occur, and from the Quartodeciman controversy, and from Clement of Rome. The value of the evidence which Dr. Taylor's acute vision has discovered consists chiefly in its cumulative force. From familiarity with the passage numerous traces of it arose; or as Dr. Taylor takes the case reversely, from the fact of the occurrence of numerous traces evident to a close observer, it is manifest that there pre-existed in the minds of the writers a familiarity with the language of the verses in question. According to Eusebius of Caesarea (Eccl. Hist. 2.9.1–4), Herod Agrippa I in his first year of reign over the whole Judea (AD 41) killed James, son of Zebedee and arrested Peter, planning to kill him after the Passover. Peter was saved miraculously by angels, and escaped out of the realm of Herod (Acts 12:1–19). Peter went to Antioch, then through Asia Minor (visiting the churches in Pontus, Galatia, Cappadocia, Asia, and Bithynia, as mentioned in 1 Pet 1:1), and arrived in Rome in the second year of Emperor Claudius (AD 42; Eusebius, Eccl, Hist. 2.14.6). Somewhere on the way, Peter picked up Mark and took him as travel companion and interpreter. Mark the Evangelist wrote down the sermons of Peter, thus composing the Gospel according to Mark (Eccl. Hist. 15–16), before he left for Alexandria in the third year of Claudius (43). In AD 49, about 19 years after the Ascension of Jesus, Mark traveled to Alexandria [cf. c. 49 [cf. Acts 15:36–41] and founded the Church of Alexandria - today, both the Coptic Orthodox Church and the Greek Orthodox Church of Alexandria claim to be successors to this original community. Aspects of the Coptic liturgy can be traced back to Mark himself. He became the first bishop of Alexandria and he is honored as the founder of Christianity in Africa. According to Eusebius (Eccl. Hist. 2.24.1), Mark was succeeded by Annianus as the bishop of Alexandria in the eighth year of Nero (62/63), probably, but not definitely, due to his coming death. Later Coptic tradition says that he was martyred in 68.